Death in the hands of an artist is almost paradoxical: while as a lived experience it is unknown and unwelcome, as the subject of art it can become a site of wonder, imagination, and inquiry. In other words: death can be generative. In the sense that it inspires the desire to make art, death is creative; in the sense that it elicits response, death is productive. Refuting the very idea that death need be an end, art—with its ability to facilitate any and every mode of interpretation—creates a space for infinite inspiration. Patricia Cronin’s practice may be gleefully un-tethered and diverse in terms of formal similarities but each of her works shares in the incorporation of themes of death. Patricia Cronin, “Canto XXXIV: Circle Nine, Complex Fraud and Treachery,” 2011-12. Oil on linen, 64 x 138″. “Memorial to a Marriage,” 2002-2012. Bronze, 17 x 26 1/2 x 52″. Courtesy of the artist. Photo by Brian Buckley. 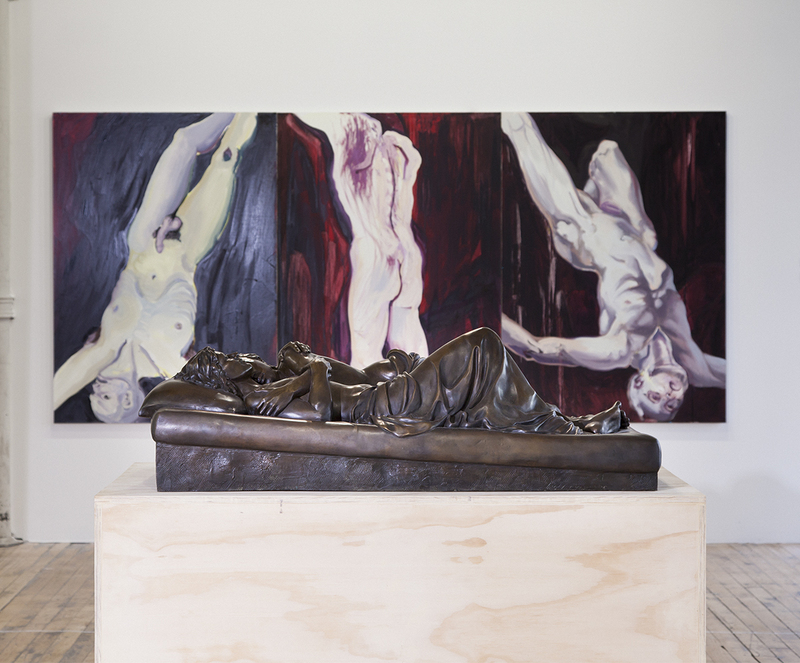 Memorial to a Marriage (2002) (a sculpture) and Canto XXXIV, (2011 – 12) (a painting) although formally quite different, are both complex explorations of the subject of death. As a grave maker for Cronin and her wife, Memorial to a Marriage eternally casts the subtlety of an idealized female couple’s loving gestures in bronze. Inspired by life but intended to signify after it, these bodies lie somewhere in between the present and eternity. In contrast, Canto XXXIV—a triptych inspired by Dante’s Inferno—exploits the expressive possibilities of the language of painting to purposefully depict non-idealized and anguished forms. Rather than provide explicit narrative context, the work instead focuses on the painterly execution of bodies and crafts a visceral image of what might await us in death. Even with their different perspectives and formal styles, when viewed together these pieces work off and with each other to illuminate, complicate, and imagine their subjects anew. Placed in dialogue they read not as opposites, but as complements. The expressive possibilities of the human form, the complexities of time and the inexplicable desire to traverse it, and, of course, the ability of death to produce these meditations are all illuminated in their interaction. Cronin’s pieces on death are then not somber, but celebratory: they relish in and produce the very paradox of death.